By 1444 Scotland has stood steadfast, fighting for and winning its independence from its would-be English overlords.Scotland threw off the yoke of English rule after Robert the Bruce routed the English at Bannockburn in 1314, and has since consolidated its control over northern Britain. Scotland's protection comes not only from its brave armies, but also from the Auld Alliance with France. This agreement obligates France to come to Scotland's aid should England once again try to subjugate them. War is an ever-present possibility as the marcher lords on both sides of the border threaten to escalate conflict through frequent skirmishes and a tendency to opportunistically switch sides for the sake of better raiding opportunities. It has taken many years for Scotland to incorporate the Highlands into the kingdom. The Middle Ages saw the annexation of the formerly autonomous Kingdom of Moray, home of the usurper Macbeth, and the expansion of feudal institutions into the northern mainland. The integration of the Highlands would serve Scotland well as it became a staging ground for recruitment in the war against Edward Longshanks. The Hebrides were wrested away from the former Kingdom of the Isles under Alexander II and not even the intervention of the King of Norway could halt the Scottish assault. 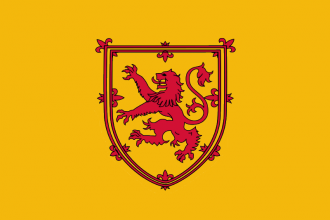 King James II has plans to further extend the Scottish domain in the surrounding isles. Orkney and the Shetlands are held by Norway, which is itself currently subject to Denmark. Taking on the full might of Scandinavia would be challenging, but perhaps a diplomatic solution will present itself. England and Scotland have squabbled over the Isle of Mann for centuries. Currently the English have the upper hand, but an opportunistic ruler might exploit their preoccupation with fighting France to seize it for themselves. The House of Stuart has ruled Scotland for less than a century, but they have ruled well. If Scotland is able to turn the tide against England, the Stuarts could one day rule all of the British Isles. Scotland is a country in the British Isles that is capable of forming Great Britain. It is economically isolated in the northern portion of the British Isles and sits on the North Sea trade node. Scotland also has access to the only strait crossing between Ireland and Great Britain. With Rule Britannia Scotland has an unique set of missions. Scottish events revolve around defending against an aggressive England, the religious turmoil experienced during the reformation and evolution of trade economics. Scotland can form Great Britain both militarily and diplomatically. Scotland can be re-formed by any country with Scottish or Highlander culture if it should cease to exist. The once proud nation of Scotland has fallen into ruin, yet there remain some among the Clans with the will to restore our kingdom. We will muster our courage and fight for a free and independent Scotland. is not the Holy Roman Empire, the Papal States or Great Britain. has Scottish or Highlander as primary culture. gets a permanent claim on every province in the Lowlands, the Highlands, and the Isles that it does not already own. moves its capital to Edinburgh (251). Playing with Scotland can be a lot of fun, if you choose the right alliances. With England as a big and difficult rival and an enemy, Scotland should ally a stronger nation like France in the early game. If the goal is to achieve getting France as a vassal, the player should have an alliance with France's rivals. Burgundy is one good example but it is even better to ally France and first defeat England and then invade France with their enemies, maybe later together with Castile (Spain) or even Austria. The Player should try to get the Isles, which are controlled by Norway in 1444, by declaring war on Denmark while they are fighting against the Livonian Order to trigger the mission of Scotland's mission tree. It is also important to have a foothold in Normandy or Britanny. By choosing these regions as important land for Scotland, France will give this during the war with England to the Scottish, if they are allied to them. That can be very important, getting a foothold in the French land, to occupy France later in the game or even to expand or to colonize. This page was last edited on 29 March 2019, at 02:07.